Those daffodils are amazing...really amazing. Love your cheerful daffodils! Hurry up spring! Is the hawk on your land?? I love the daffodils. 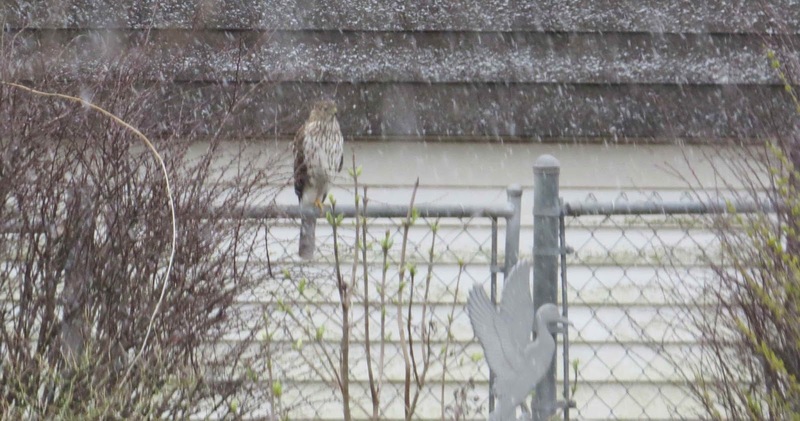 Yes, the hawk is sitting on our back gate. 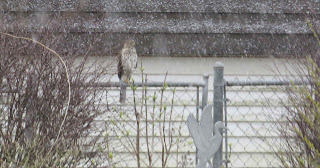 It likes to sit there because many House sparrows dive into the shrubs on either side of that gate. They are barberry shrubs which have horrible thorns. It doesn't care sometimes it just dives in after the sparrows. Amazing. Thanks Cathy.This snow won't last long. I just hope it doesn't get much colder. I so agree about the warm house and the food, though we are mostly drinking lots of coffee this morning. Really feel like cocooning today. Wish I had brought in more flowers as well, though you are much further along in the season than me. It is really warm here today. In the 30's but the wind chill is causing snow instead of rain. It may turn to rain soon we will see. I just hope it doesn't get really cold. That is what is so detrimental to the blooms. The Narcissi are beautiful but I love that photo of the hawk! I like the deep orange centers on that first group of daffodils. Plenty bold. Nice photo of the hawk. They're amazing creatures to watch. Your narcissi are just the balm to weather these late winter squalls. March can be so unpredictable! 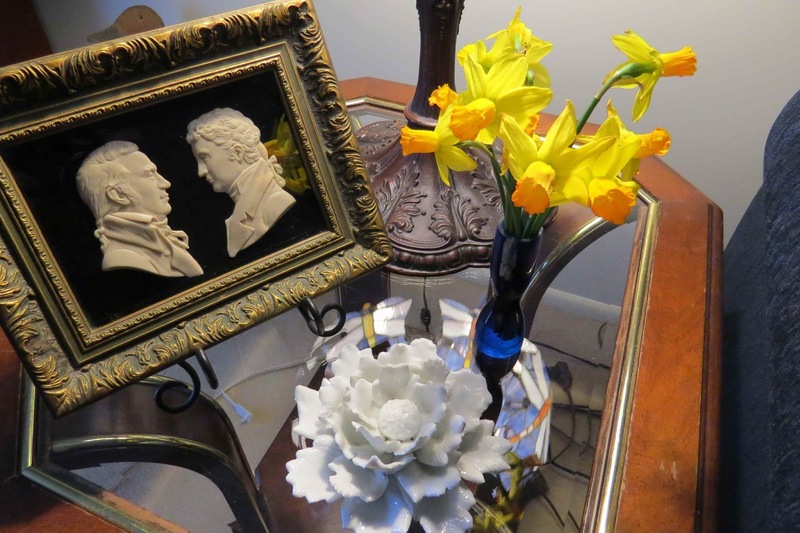 Dear Lisa you are giving me spring fever with your lovely vase of daffodils. I hope mine will soon be growing as well. Hugs! 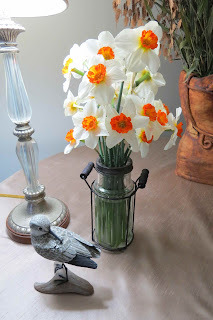 Those white and orange daffodils are really stunning! Unusual, too. I love bringing in daffodils. Yours are gorgeous!